Browse: Home / arp-spoof ~ ARP-Spoofing tool written in Rust language. arp-spoof ~ ARP-Spoofing tool written in Rust language. This tool allows intercepting Ipv4 traffic between two hosts on the same network. Typically between one machine and the internet gateway. 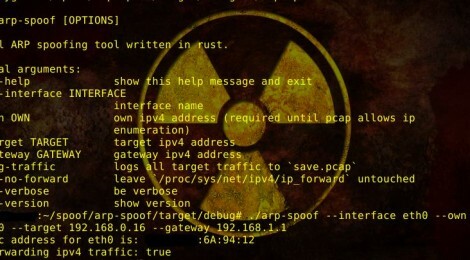 – remove –own parameter as soon as rust-pcap allows ip enumeration. ← PenBox v1.1 ~ Pentesting tools auto downloader Script.